Besides the Courthouse, one of the main focal points for Kittanning is the bridge. 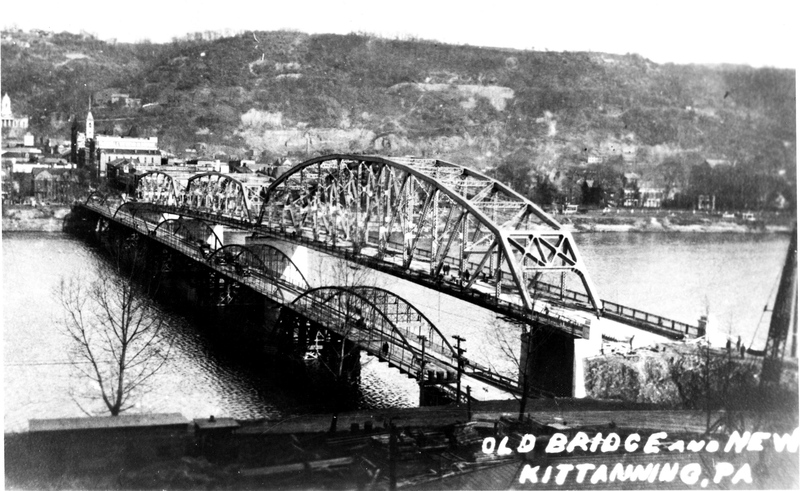 At one time to easily reach Kittanning from the west, the Kittanning Bridge was needed to reach the destination of town. Very few options existed upstream or down the river. There were a few ferrys at various spots, but the loading and unloading made for a long day. Having the bridge really increased the commerce trade for the farmers, to bring their crops to the markets of Kittanning. 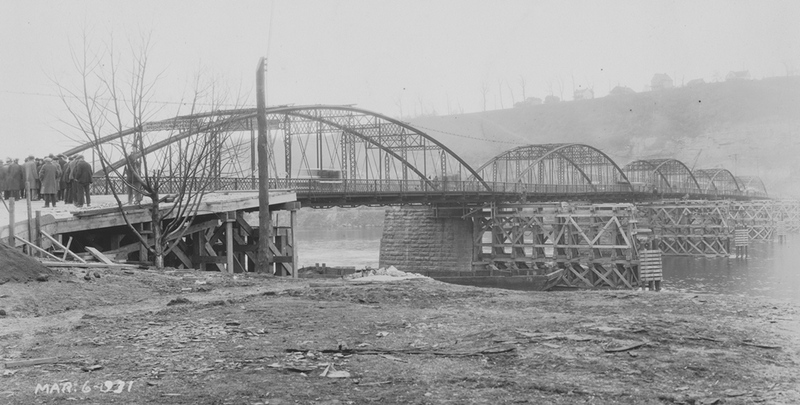 The construction period for the new (current) bridge was around 1930-31. A bridge was already on site, but in 1928 the War Department declared the bridge to be removed, due to obstruction to navigate. They ordered the construction of a new span and if not, then Armstrong County was subject to penalties for non-compliance. A 400 foot wide channel with 9 foot depth, and 47 foot minimum height clearance was required. The existing bridge was so low that barges had difficulty supplying material for #7 Lock and Dam that was already under construction. There was strong advocacy from as far north as Franklin and Oil City to develop navigation with the projected building of Locks #9 and #10 also. Without the raising of the bridge, the future pools developed to navigate the waters would be wasted. It was believed that the natural resources of sand and gravel, coal, coke, and petroleum products, would provide a sufficiently large amount of tonnage to justify the expenditure. In 1929 Pennsylvania Governor John S. Fisher signed a bill, that permitted the Commonwealth to take over the bridge as part of the State’s primary roads. This secured the funding, but in turn the Highway’s Engineers were in charge of selecting the site and design of the type of bridge to be built. Even as similar as today’s political situations, the county was freed from financial obligations, but lost jurisdiction on the location. There was strong opinion that the location be moved one street south of Market to Jacob Street as the crossing. This would have eliminated the sharp curve at the bottom of Pine Hill Road which was nearly 180 degrees and also provide less than a 90 turn, creating a safer entry onto the bridge at the bottom of the steep hill. The northern end of Applewold would be eliminated. Meetings were held at the Chamber of Commence, and petitions were signed by Kittanning businessmen and citizens to secure the Market Street location. The town won this hard fought battle. At that time only Pine Hill Road was available to travel to the West Kittanning area, south to Pittsburgh, and west to Worthington. The existing road frequently traveled today to the Kittanning Highlands wasn’t built at this time. To accommodate the traveling public, wooden pilings were built upstream to moved the old bridge for temporary usage while the new bridge was being constructed. With the advent of the automobile and truck traffic, the newly built structure would provide service for many years. 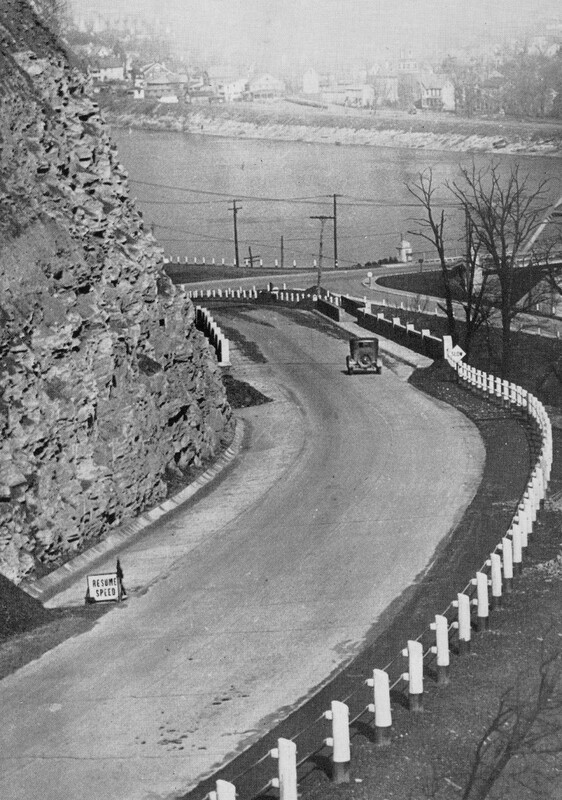 Within a few years after the construction of the bridge, a new road was built to carry traffic to the Kittanning Highlands and to minimize usage of Pine Hill Road, which still had the dangerous curve at the bottom. 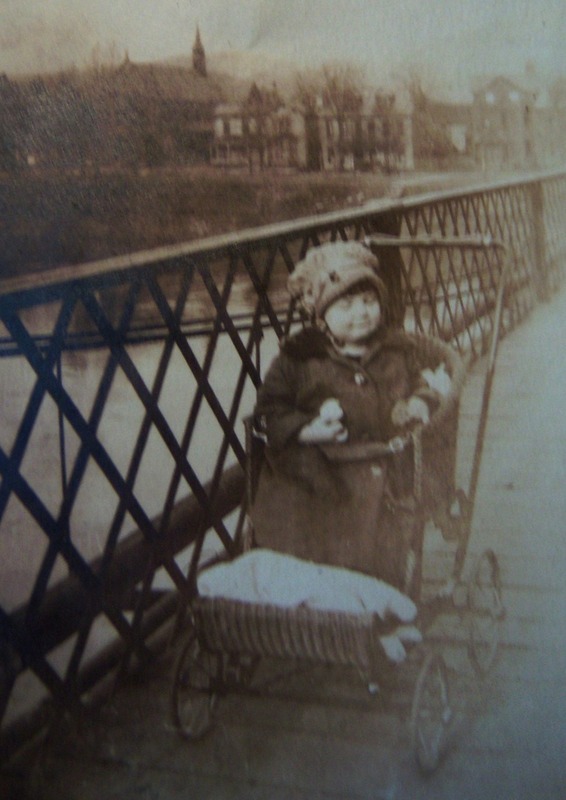 Here is a Photo from my Good Friend Mary (Bonner) Miller when she was about 3 years old (Circa 1925) and taken on the old bridge. Mary is one of the few people still living that recalls being on the Old Bridge. She says that you could see the water between the wooden planks, and how that was quite frightful as a child. She even recalls as a child her father Alex Bonner taking her to see the new road being built to West Kittanning, as the family lived at 204 Arthur Street at the time. Materiel storage for construction of the bridge at the Shawmut Railroad station. Older Photo(on right) from Calvin Miller Sr. He resided at 134 Allegheny Ave. in Applewold and would visit the construction site frequently.